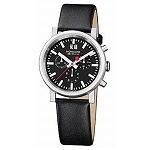 The famous Swiss Engineer and Designer, as an employee of the Swiss Federal Railways, created in 1944 a patented classic, the "Official Swiss Railways Station Clock". 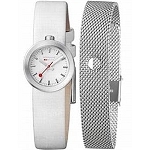 The registered pattern protected wrist-watch version was developed by Mondaine in 1986. 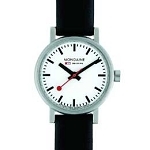 The simple design, the unmistakable easy-to-read face, distinctive hands and the famous red seconds hand have made the Mondaine collection successful the world over. Ingenuity and simplicity are the elements, which often distinguish an attractive piece of design from a truly iconic design classic. 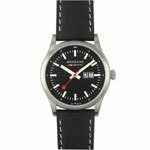 The Mondaine Official Swiss Railways watch is proud to be associated with such an example of excellent 20th century design. In 1944, Hans Hilfiker, a Swiss Engineer and Designer and employee of the Federal Swiss Railways, created a clock, which has become known as the "Official Swiss Railways Clock". It is amazing just how long this design has endured and now it appears to take a place in the eternal hall of fame along side other well known design icons such as the Coca-Cola bottle, the Mercedes star, the Toblerone packaging, or the design of the US dollar bill. 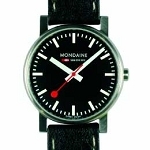 In 1986 the Mondaine watch company, owned by the Bernheim family, took the blueprint of the iconic-patented design of the Railways Clock and turned it into a watch collection. 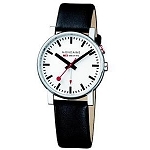 These watches are the famous clock in miniature and carry the same Swiss reputation of excellent watch making skills, punctuality and uncomplicated design. 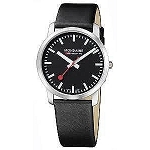 The Mondaine collection has in turn become a respected design in its own right and has gone from strength to strength and today it is widely considered to be one of the "10 Classic Swiss Watch Designs". 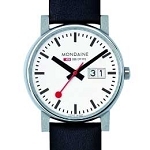 The Mondaine Watch collection continues to grow in popularity in Europe, the United States of America and the Far East, easily recognizable as the clock seen on all Swiss railway platforms, responsible for the legendary punctuality of the Swiss retail network. 60 years after its creation there are some 3000 of these clocks on station concourses and platforms throughout Switzerland and even a selection in London's Design Museum where Sir Terence Conran commissioned their installation as permanent, functional exhibits. 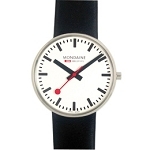 Since the first collection launched in 1986, new lines have been introduced each year to ensure that the Mondaine Official Swiss Railways Watch appeals to a wide consumer audience.